Chad's government has admitted for the first time sending its armed forces into Sudanese territory. Chad said it had ended air raids against "mercenaries" in Sudan and destroyed seven groups of fighters. Defence Minister Adoum Younousmi said hundreds of prisoners had been taken and would be displayed soon. Sudan began on Thursday to complain of the raids, which Chad said were a justified pursuit of rebels who had entered its territory from Sudan. Mr Younousmi said Chadian planes and troops had made three trips about 30km (19 miles) into the Darfur region of Sudan, in order to attack positions belonging to Chadian rebels. But he stressed the target had been neither Sudan's government nor its people and said there had been no collateral damage. "We will no longer tolerate any grouping of mercenaries in a training camp, whatever the distance, however deep inside Sudan they are," he said. "Whether they are in a camp that allows them to come back into Chad to destabilise our country. We will not permit it. "We have no need for authorisation, it's our existing right. We will exercise this right at any time and in any place." The raids come after Chadian rebels mounted an unsuccessful attack in the east of the country earlier this month. The two states have long traded accusations of supporting rebels in each other's territory, especially around Sudan's war-torn Darfur area. Rebels have been trying to topple Chadian President Idriss Deby for more than three years. Although Khartoum has repeatedly denied backing the rebels, analysts note the insurgents have operated out of Sudanese territory for several years. 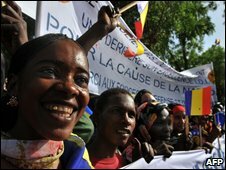 Sudan has also long accused Chad of supporting rebels in Darfur. In May 2008, Khartoum accused N'Djamena of backing Darfur-based insurgents who launched an unprecedented attack on the Sudanese capital. Many Darfur rebels are from the same ethnic group as Chad's President Idriss Deby, and ever since their uprising began, he has been accused of offering them support.